The World Health Organization has issued three global health challenges. The first was on hand hygiene, and the second was on the surgical safety checklist. 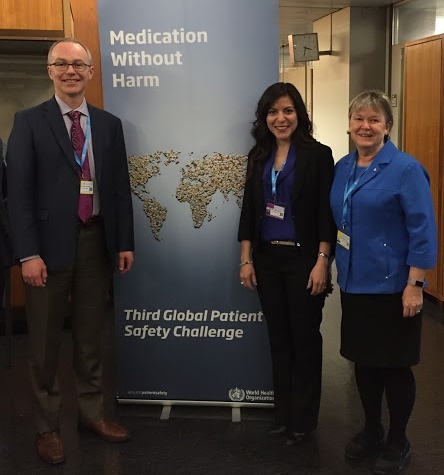 The third global challenge, ‘Medication Without Harm’, focuses on polypharmacy, transitions in care, and high risk medications and situations. This global challenge is more complex than the first two. Although it was launched in 2016, political endorsement has been slower at the country level perhaps as a result. On behalf of the WONCA Working Party on Quality and Safety, I attended the WHO consultative meeting “Implementing WHO’s Global Patient Safety Challenge: Medication without harm. Country guidance” in November 2018 in Geneva. Fifteen national experts, ten national organizations, five WHO re gions, and nine international organizations were represented. I made a brief presentation on WONCA in general and on the work of our working party on quality and safety in particular. Our contributions were well-received, and as there were no other representatives of health professionals, I was glad we were invited and able to attend. Photo: Ruth Wilson (right) with Dr Mike Hamilton, another family physician, and Sandi Kossey, form the Canadian patient safety institute. Sir Liam Donaldson, WHO special envoy for patient safety chaired the meeting and expressed the importance of family doctors and WONCA as being key to achieving the aim of medication without harm. Neelam Dhingra-Kumar of the WHO suggested that every GP office should post the five moments for medication safety poster in their office. Resources to support this global safety challenge are still in development. Key technical documents, research priorities, undergraduate patient safety curriculum on medication safety, and an evaluation are still to be released. Nevertheless this is an area where family doctors can make a big difference in patient safety, and I am sure our continued involvement will be appreciated.